The game's definitely feeling more gamey, now. Today's additions include a little target, scoring methods, and a limit of 6 missiles to fire. They're not "Amazing" tweaks to the formula, but they've changed the thing from being a plaything to more of a game. With a specific set of rules, the gameplay's emerged pretty well. 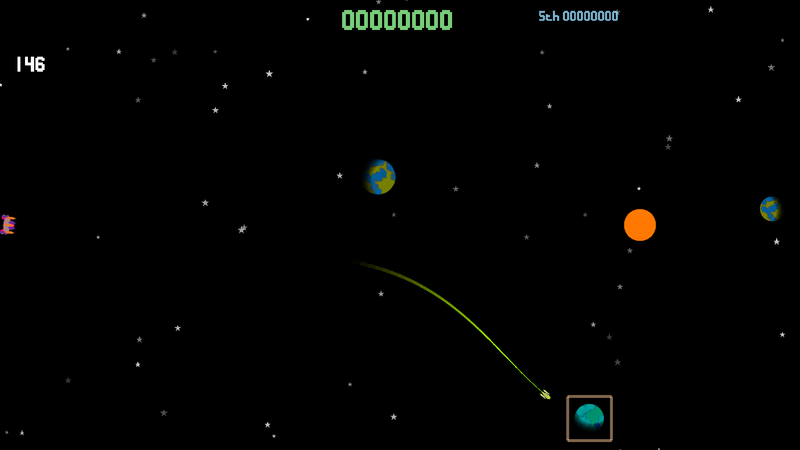 I've added a little (doesn't move) ship to fire the missiles, and there's a target planet which you get bonus points if you hit. Tomorrow I need to add some sounds, and maybe a bit more graphical oomph to the game, and a bit of .. um.. "Feels" to the whole thing. Not sure how best to describe the "feels", but my head is definitely telling me that the "feels" are missing. And then the usual endy bits, like a title and an icon and things like that..